Creatine has been clinically proven to increase physical performance in successive bursts of high intensity exercise. World’s First Creatine HCL Creatine Magnapower blend. Nobody wants to be wasting their time weighing, mixing and loading their Creatine. Nor do you want any digestive discomfort, bloating or water retention. Forget the dated methods and get the results in the gym quicker with Adapt Nutrition’s CreaTec 1500 – the world’s first Creatine HCL & Creatine Magnapower blend. It is conveniently available in capsule form so you can experience more efficient and explosive effects, without the need to take multiple products. 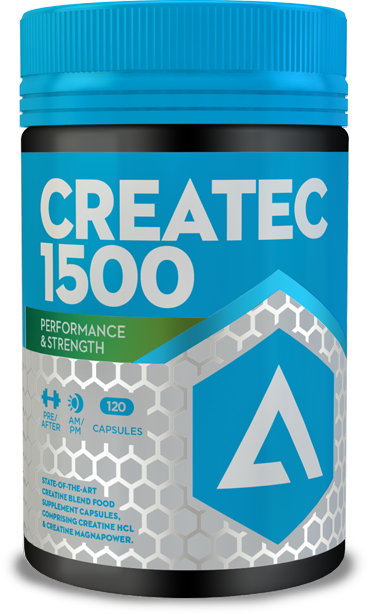 CreaTec 1500 provides the Creatine and Magnesium that are essential for effective ATP synthesis. For further more detailed information please refer to our blog for specific ingredient articles. Ingredients: In a 2 piece gelatin capsule: Creatine Hydrochloride, Creatine Magnapower (magnesium creatine chelate), Magnesium Stearate, Microcrystalline Cellulose. Other ingredients: This product is a food supplement and should be used in conjunction with food as part of a balanced, varied diet and healthy lifestyle. This product is not intended for use by people under the age of 18. This product is not design to prevent or cure any illness or ailment. May contain traces of milk, gluten and nuts. Do not exceed recommended daily dose. Keep out of reach of young children. Capsules are certified Halal & Kosher and meet all requirements of current EP & USP.